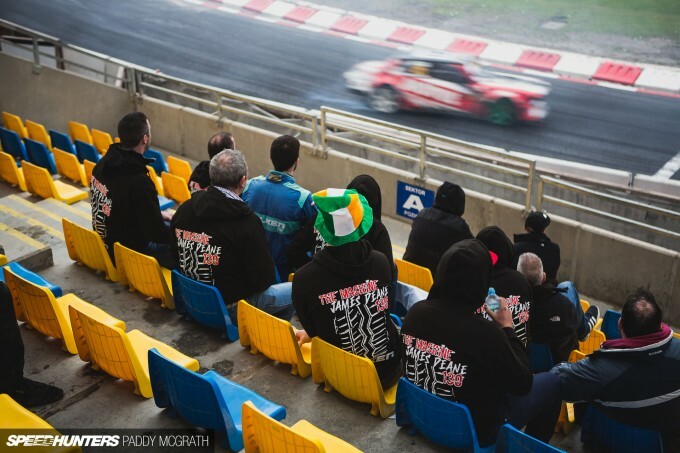 James Deane should be no stranger to any drift fan. 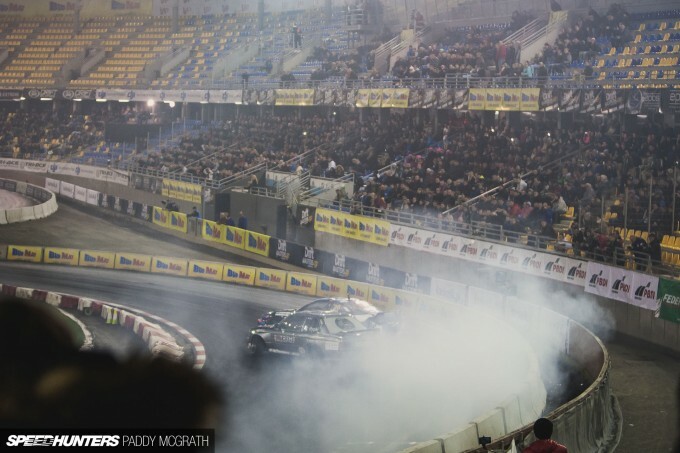 The 24-year-old from rural Ireland has been a phenom within European drifting for almost a decade. 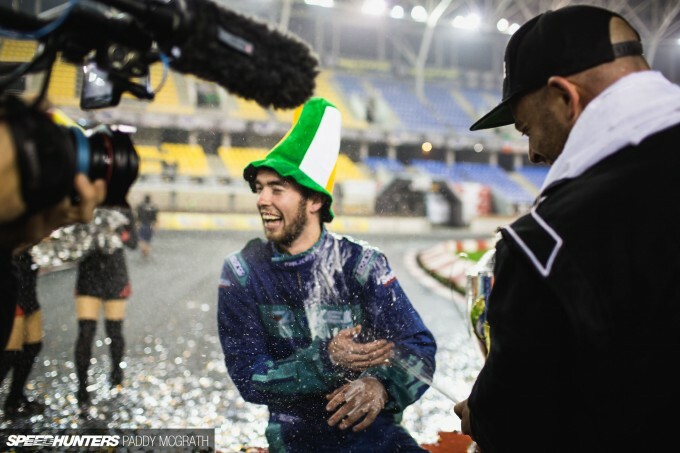 He won his first championship at 15 years old. 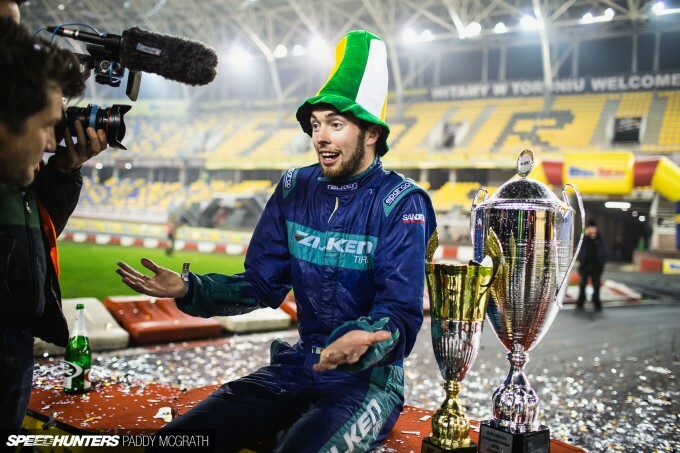 A year later he was Prodrift Ireland and Prodrift European champion and his success has continued pretty much unabated since. 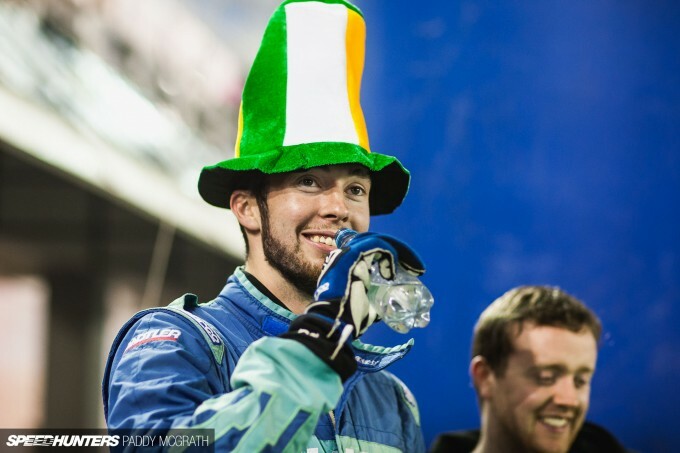 He recently snatched the 2015 Irish Drift Championship from right under the noses of two 16 year olds, who were battling each other with 1,500hp. I feel quite lucky to have been present for many of the highlights of James’ career, and my hope was to be present for another in Poland. 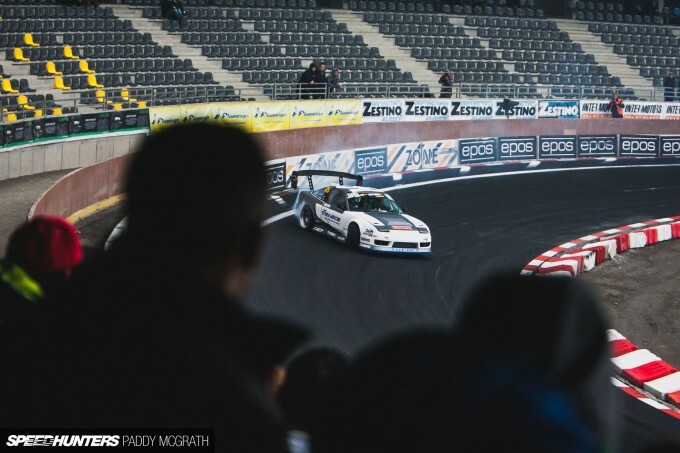 On this grey and particularly damp weekend, James would compete for potentially his third Drift Allstars European title at the MotoArena in Torun, a historical city in northern Poland. 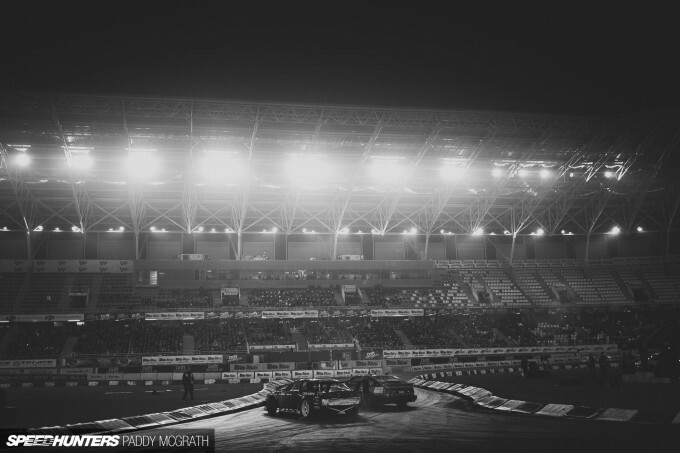 The stadium is a familiar venue within Poland’s incredibly popular Speedway series, but for this weekend a custom tarmac track was laid out. 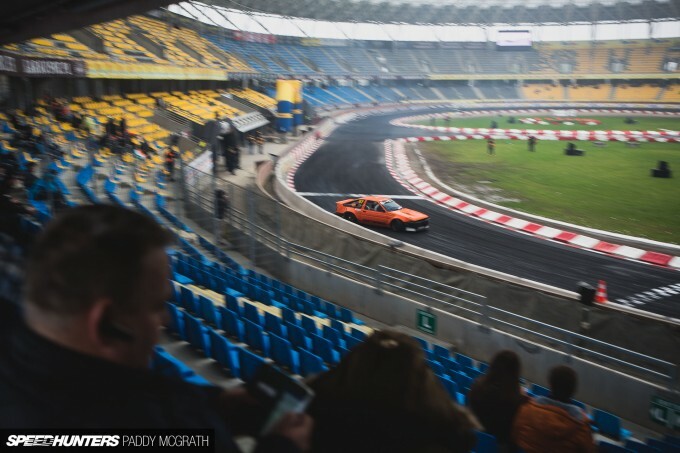 With the large outside corners remaining relatively dry and the centre section staying wet for most of the event, the driving conditions were tricky. Drivers had to transition from dry to wet and back to dry again in as smooth a motion as possible. 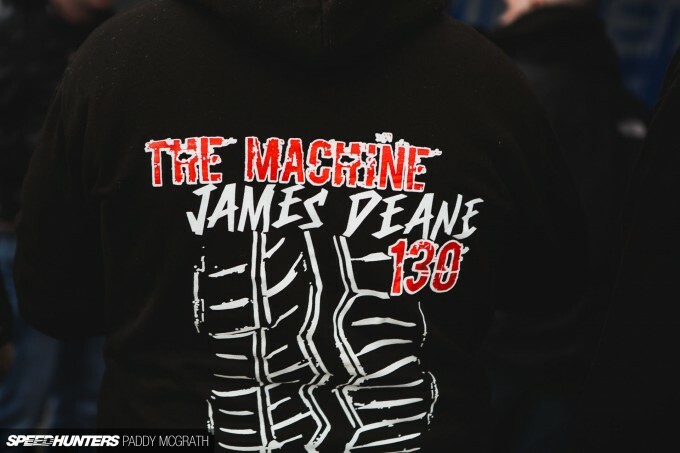 There are some things that you should know about James Deane. Firstly, he’s as tall as he has been successful. That is to say, very. 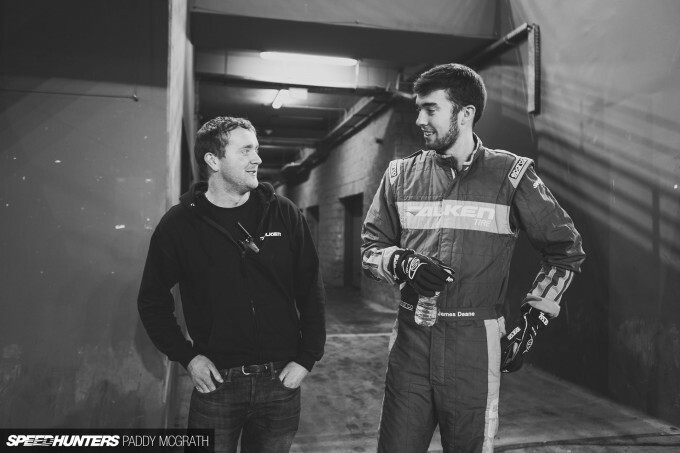 He’s also one of the most genuine and humble drivers in the paddock. He never takes anything for granted nor does he have any arrogance about him. His success has been earned the hard way. 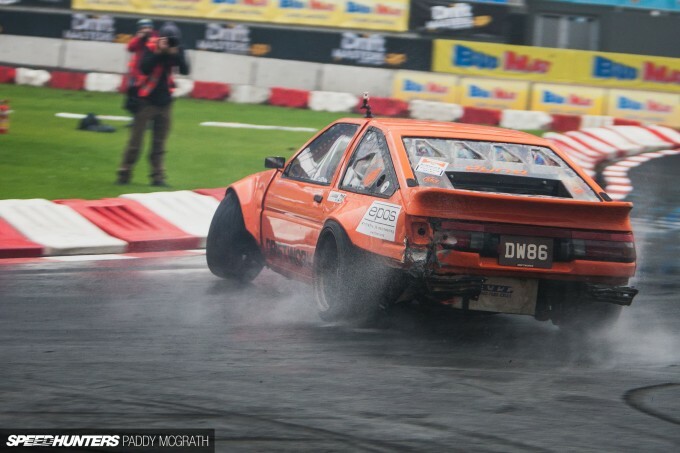 With the help of his family, James has built his own car which has enjoyed considerable success over the last two seasons. 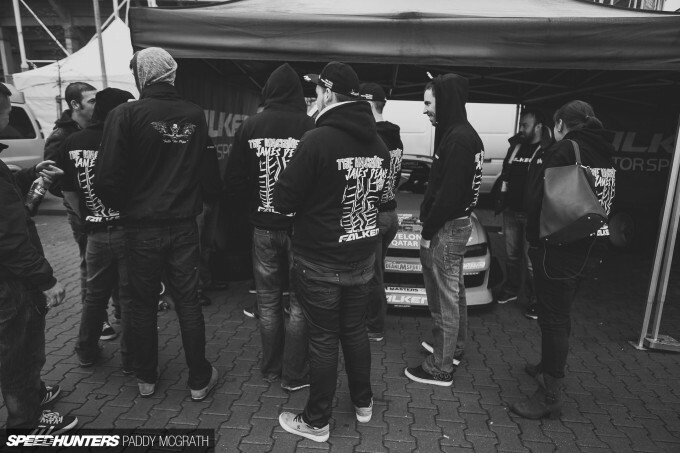 Compared to some other teams in the Drift Allstars paddock, his setup is incredibly modest too. 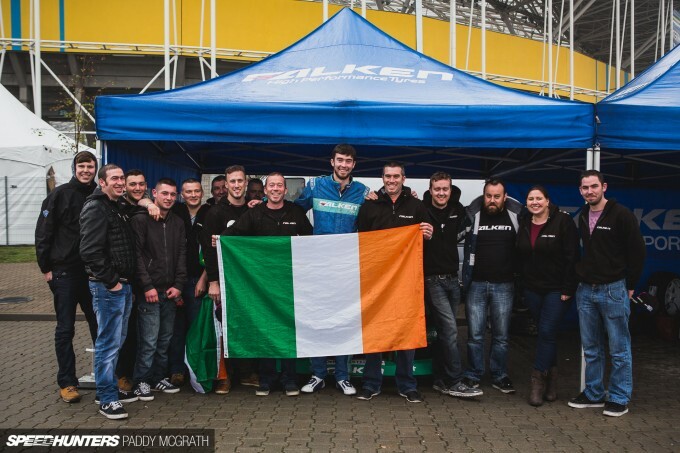 Trailering his car from Ireland across Europe is never going to be an enjoyable experience, but he’s always supported by a contingent of friends and family who come to support him at each and every event. His appreciation is clear too, as he usually saves an extra couple of donuts or burnouts during parades for the Irish section of the audience. 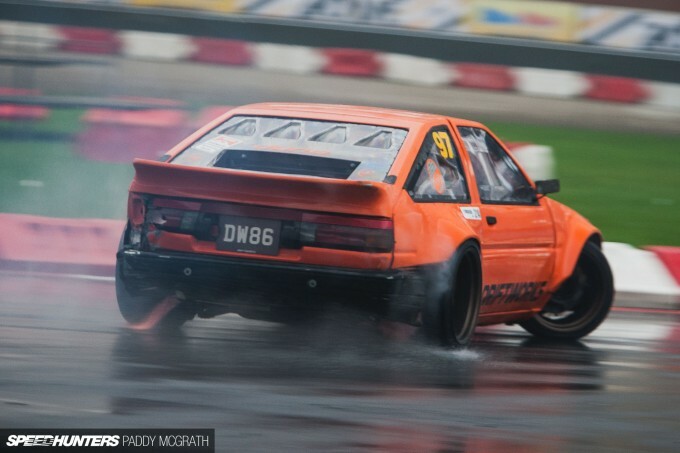 For James, his entire Drift Allstars season would come down to one day against 48 drivers battling for 16 places. 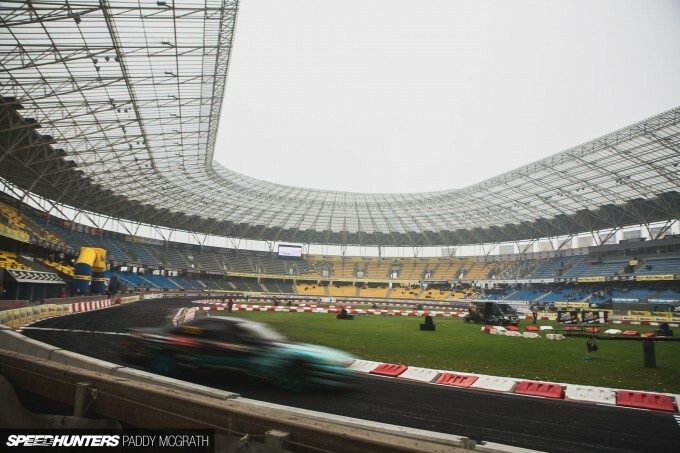 The strict judging criteria and a random running order for qualifying made it very difficult to gauge just how well any one particular driver was doing. He wouldn’t be alone either. Separated by a negligible amount of points, Latvian driver Janis Eglite has been matching James blow for blow all season. Make no mistake, he’s an incredibly capable driver. Whilst the title could only go to either James or Janis, there were plenty of potential stumbling blocks in the mix as well for both drivers. Polish champion Piotr Więcek was one of many drivers who could easily win the event. It would be wrong to assume that just because these names aren’t well known outside of Europe, that they are in any way sub-par. With three qualifying runs per driver (the best two runs are combined to give a driver’s score) qualifying was quite a long affair. 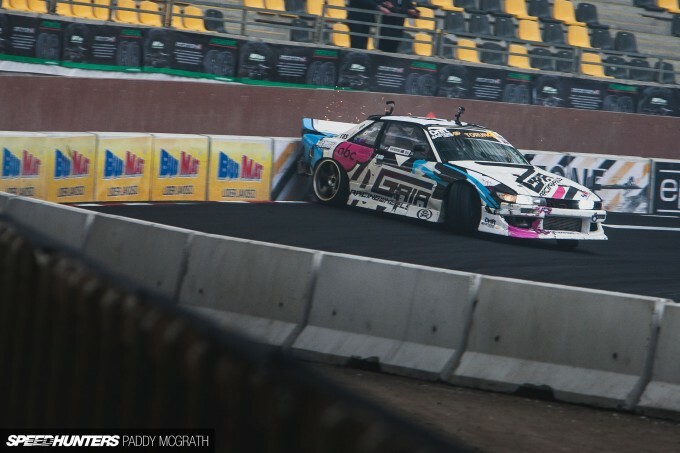 After removing his bumper on his second run, thus incurring a zero, it was probably tighter than James would have liked going into his third and final qualifier. It was a serious challenge for all involved. When it comes down to it though, there are few like James who can deliver exactly what’s required of them at any given time. 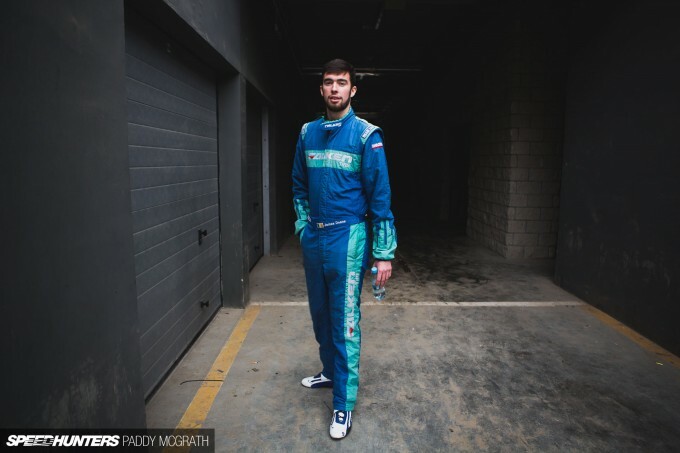 For me, it’s his coolness under pressure that separates him from so many other good drivers. With his own laps completed, it was a matter of waiting it out and surveying the opposition in the mean time. Watching from afar, I always thought it was interesting that he pays the exact same amount of attention to each competitor, leaving nothing for granted. Even during practice, if he’s paired with a slow car he will still be as aggressive, where some allow more room for the slower driver in case of an error. 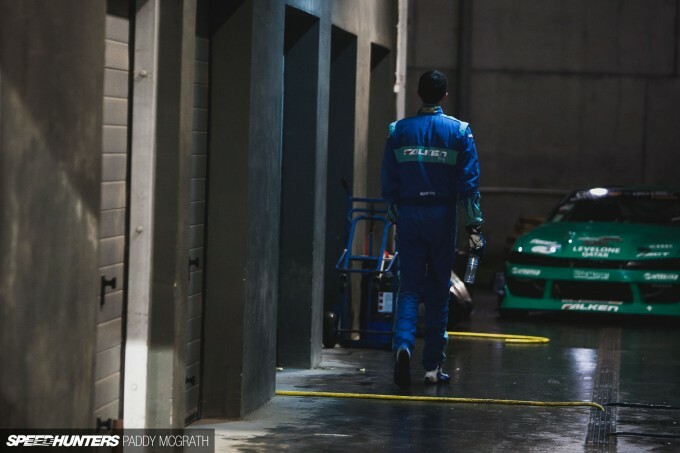 Accompanied by his crew chief and long-time friend, Michael Sheehan, and one of his brothers, Ken, I’m sure the walk to the qualifying results felt a lot further than usual for James. With a briefing before the official results were announced, the wait was prolonged even further. Add to the fact that the briefing was being presented in both Polish and English and the tension was growing by the minute. As the qualifying order was eventually revealed, starting with 16th place, that non-point-scoring qualifying run must have been running through James’ head. 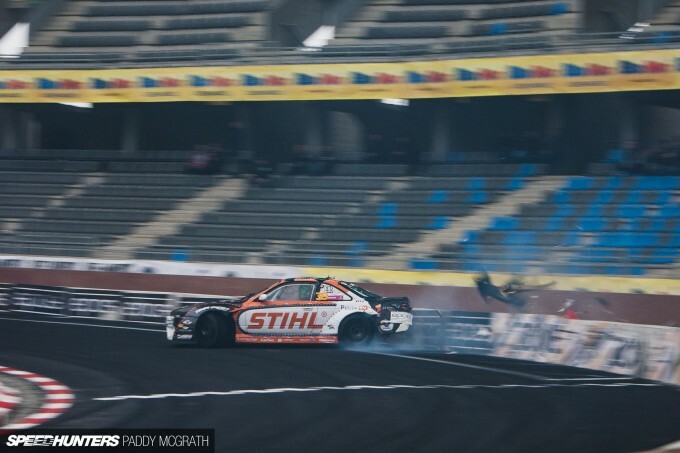 With tough competition from 47 other drivers, had he done enough or had he played it too safe? Before we knew it, the results were finished. James Deane? First place qualifier. 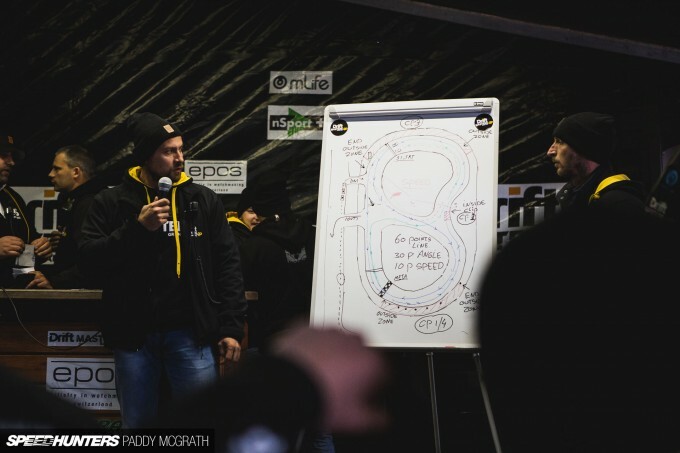 As James gave his interview to the TV cameras, his crew were quickly figuring out the varying combinations and permutations of what James would need to do to beat Janis, who had qualified sixth. It was calculated that a top four finish would be enough, regardless if Janis won the event or not. There was to be another player to enter the fray though. James’ friend and fellow countryman Nigel Colfer would face Janis in the Top 16, and if he beat him, James would be immediately crowned champion. If there was ever a time to call in a favour from a friend, this was it. With night having fallen and a fine mist still hanging in the air, the time for talk was over. The full season would come to a climax over the course of the next two hours. 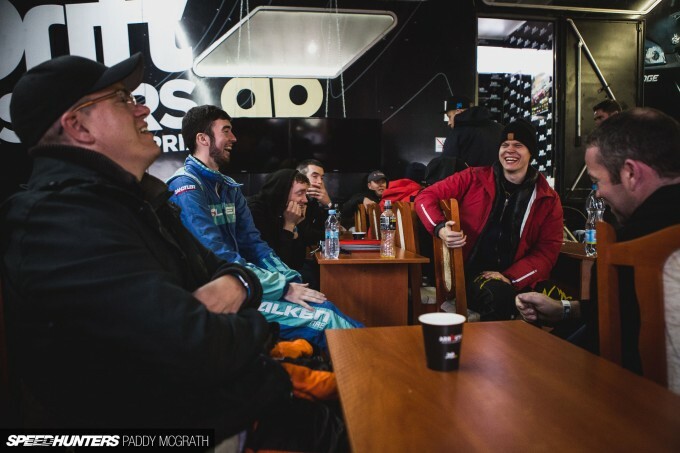 The battle order would see James face Adam Zalewski in the first battle, with Nigel facing Janis in the last battle of the Top 16. 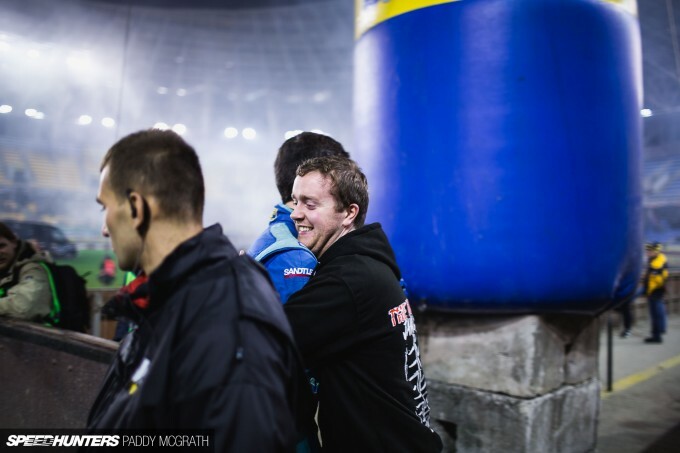 With the event being televised live on Polish television, it was a tense start to the battles for James. 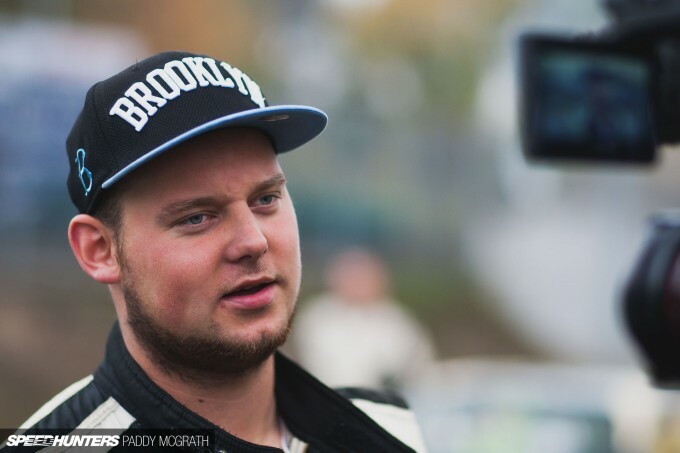 Zalewski had been extremely consistent all throughout practice and qualifying. Despite a valiant effort, a wall tag put Zalewski on the back foot and James progressed through to the Top 8 and one step closer to the title. 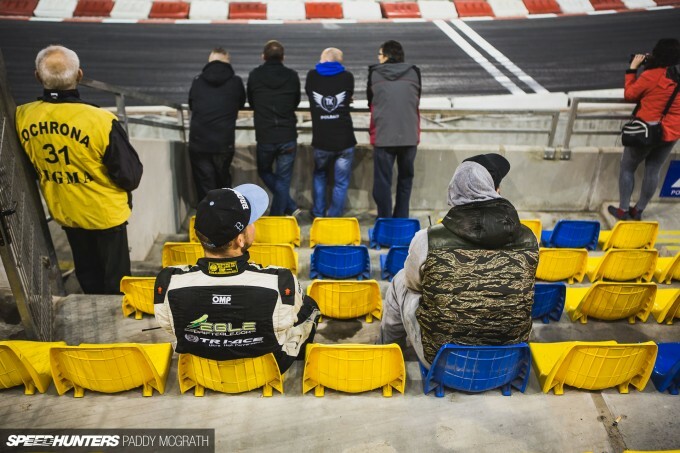 With his 2JZ-powered S14 being its usual reliable self, James took to the grandstands to watch the rest of the battles unfold. 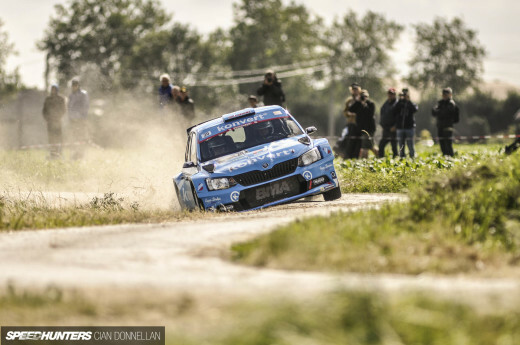 There were no easy battles so to speak, with each driver having to put up a proper fight to advance. 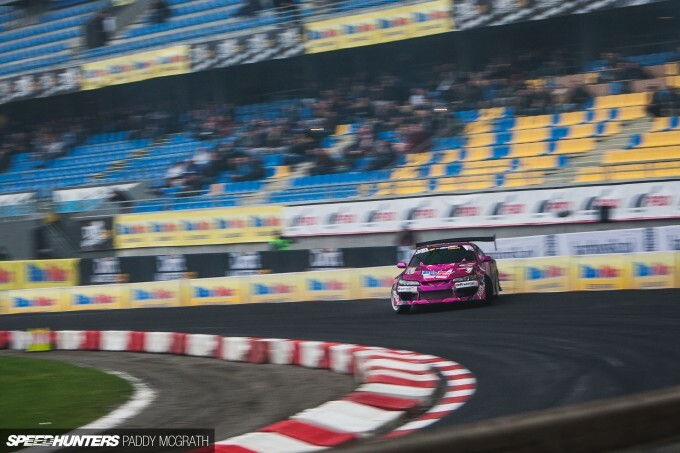 The proximity between cars was impressive, but this also meant that the competition would only get tougher as it advanced to the next set of battles. Before long it was time for Janis Eglite to face Nigel Colfer. Janis would have been the slight favourite to advance beforehand, but Nigel has been fantastically consistent all year and was looking to secure third place in the championship, so would be no pushover. With Janis leading the first run, he started strong as he powered into turn one and towards the first transition. However, coming away from the inside clip, Janis’ car over-rotated and despite being able to save it, the judges correctly deemed it to be a huge error and gave Nigel full advantage for his lead run. Nigel was never going to mess it up, was he? 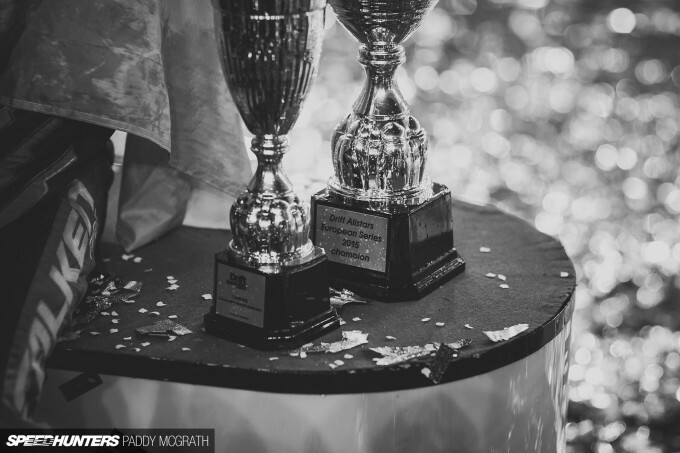 Before the Top 8 had even begun, James Deane was champion once again. His night would not end at the Top 8 either. Or the Top 4, where he beat UK driver Phil Morrison in a close duel. 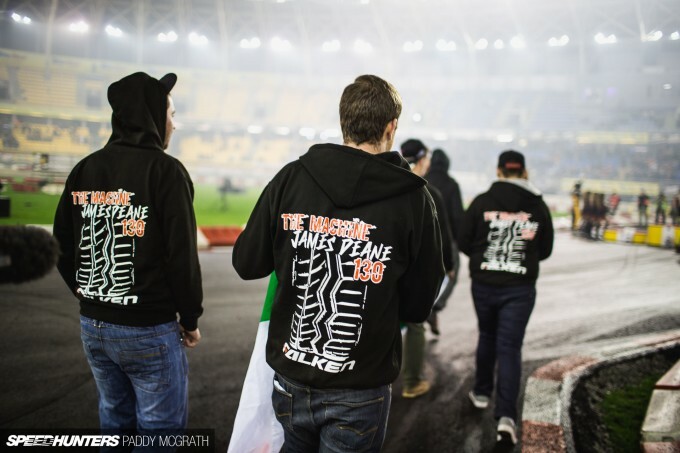 James would take it all the way to the final, where he would meet Kuba Przygonski and his mighty 1,000hp GT86. A small error on James’ lead run saw him move a water barrier which handed a full 30-0 advantage to Kuba heading into the second run. With the championship already wrapped up and with nothing to lose, James threw caution to the wind and proceeded to put on the single most incredible chase run that I have ever seen. 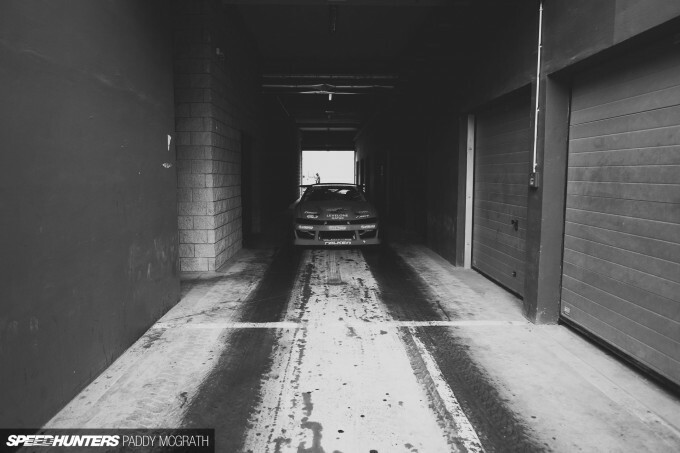 From the first corner, James was leaving tyre marks on Kuba’s door, and when they transitioned the other way he decided that the other door needed a coat of rubber too. He was never really hitting the Polish driver, just constantly nudging and provoking him the whole way around. The crowd was on their feet in appreciation of both drivers. It was one of those moments where I can feel the hairs standing up on the back of my neck just thinking about it. 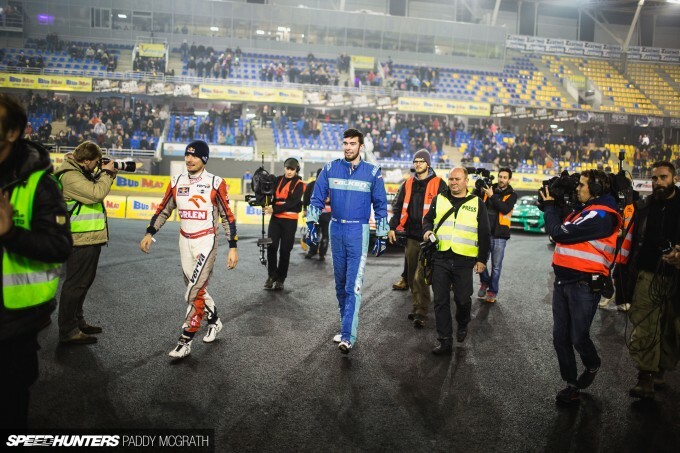 Knowing that Kuba had won the battle, James showed his appreciation to the Polish fans by destroying his Falken tyres for the last time this season. 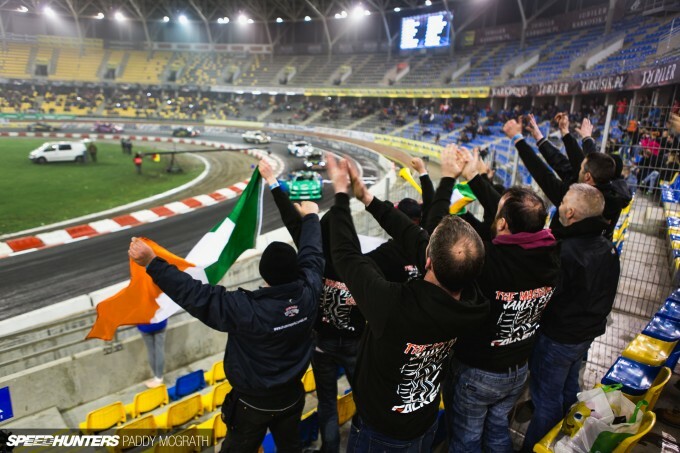 Despite always being the outsider on foreign soil all, the level of support for James throughout Europe is testament to both his driving style and his demeanour and personality. 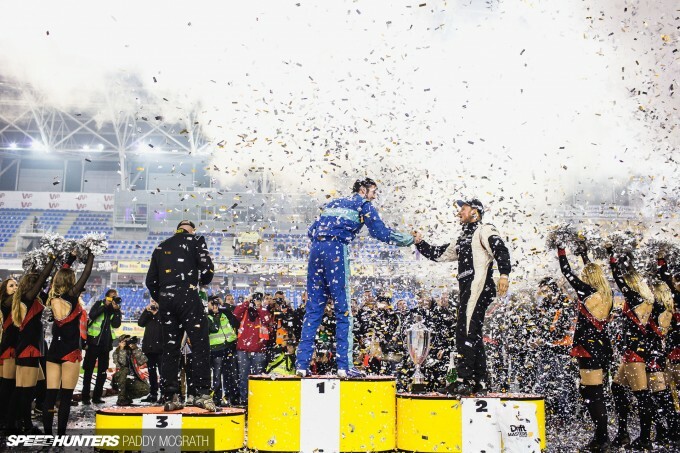 As he took to the top step of the championship podium yet again, he was immediately congratulated by Janis in a heartfelt gesture of respect between two fierce competitors. Despite only being 24 years of age, James’ dominance in Europe has been quite simply remarkable. He’s never had an ‘easy’ win, instead he’s had to fight hard against great opposition every time. 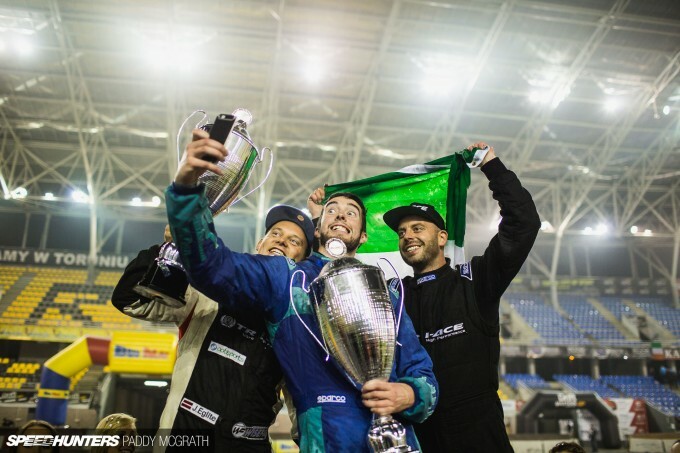 With just two wins in 2015 in Drift Allstars, but featuring on the podium at every round, his consistency ultimately gave him the edge over his competitors. With multiple national and continental titles, he has a resumé that most can only dream of. In fact, I can’t think of any other drifter that can match his haul of professional successes. What makes it all the better is that all of this has been achieved by a down to earth guy with the backing of his fantastic family and friends. They say that good things happen to good people. Well, I expect a hell of a lot more good to come to the Deane family. 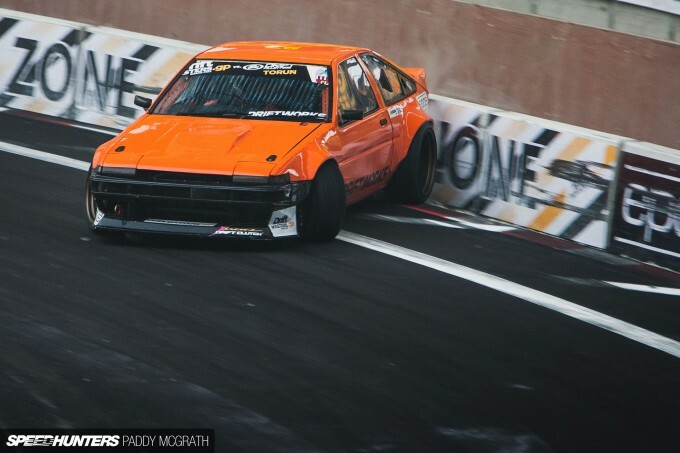 great pictures: the first of the orange 86 is my favourite! great writing: i was engaged and anxious for what would happen next. DevBizkit It really is incredible that he's so young and how much he has won already. I don't think people really appreciate just how good he is. I wanted to watch James for so long that if he will not make it next time here, I think that I woul pay him avisit in Ireland. But I do believe, that in spirit, James is more alike with the Japanese grassroot drifter than is with Vaughn JR, for example. 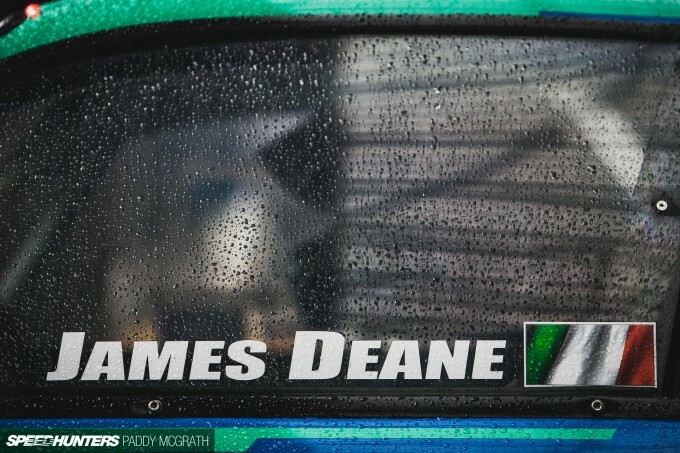 I remember first hearing about James Deane when he was a kid and being blown away. 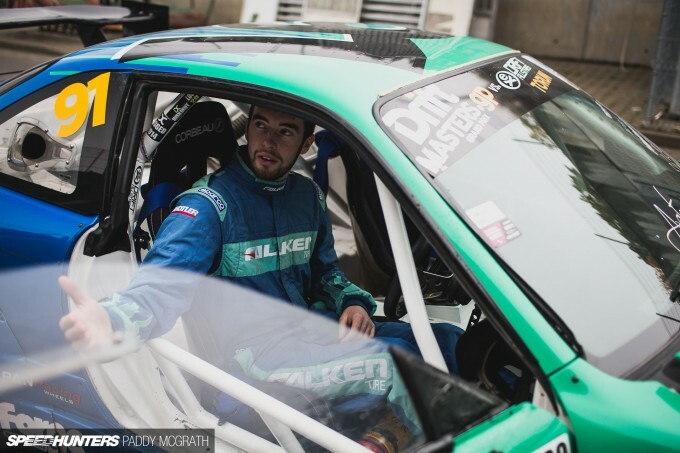 Now Ireland's got whizz kids Jack Shanahan and Tomas Kiely. 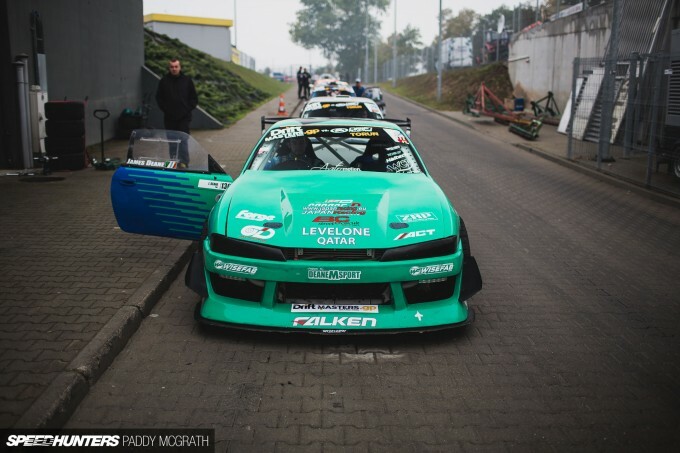 I wonder if there's a ten year old kid sitting in Cork somewhere dreaming about having his own drift car who we might be reading about on Speedhunters in five years time. 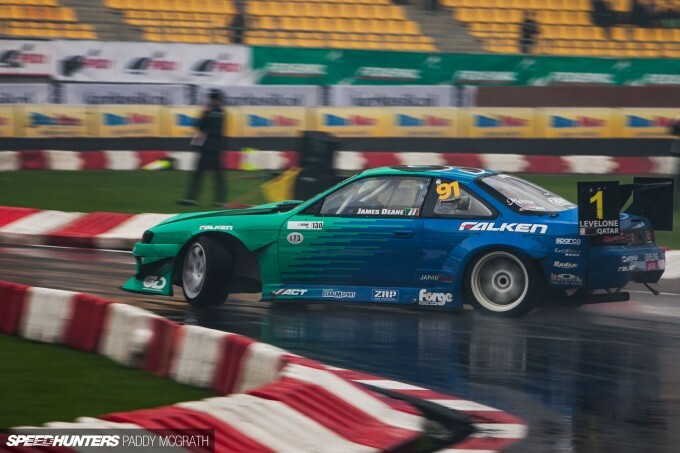 Peter_Kelly He's nine years old actually and drives a compact E36. greenroadster Plan to come and see Global Warfare next year, you won't regret it! I know its said a lot when Deane pops up but whats next? Is FD even an option? 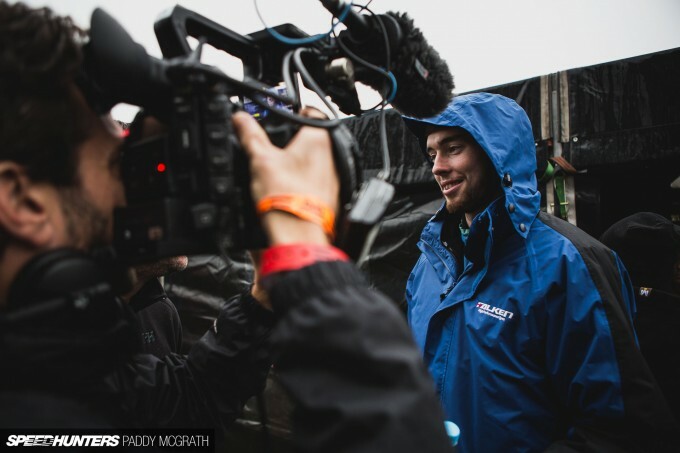 Is he happy to campaign the Irish and European series? If so, cool and I can see him continue winning for years but I'd love to see and think he deserves some sort of step up, with serious backing like Mad Mike of Gitten Jnr. has. 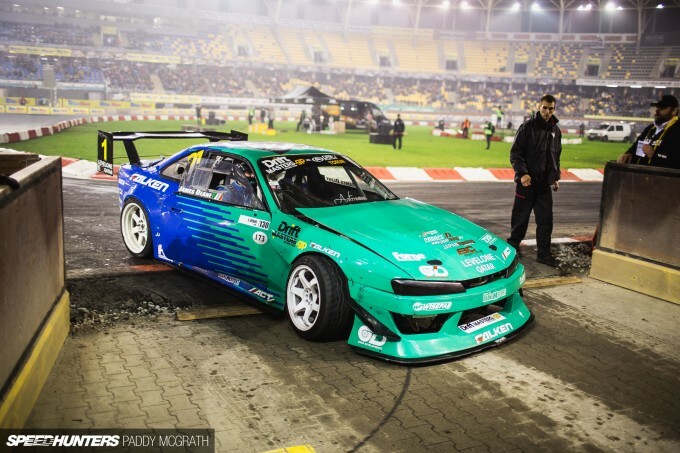 @Mk2Mad Well,he was in Formula D,how it went - i don't know.But he is to good for Drift Allstars,he needs to go higher. BTW. 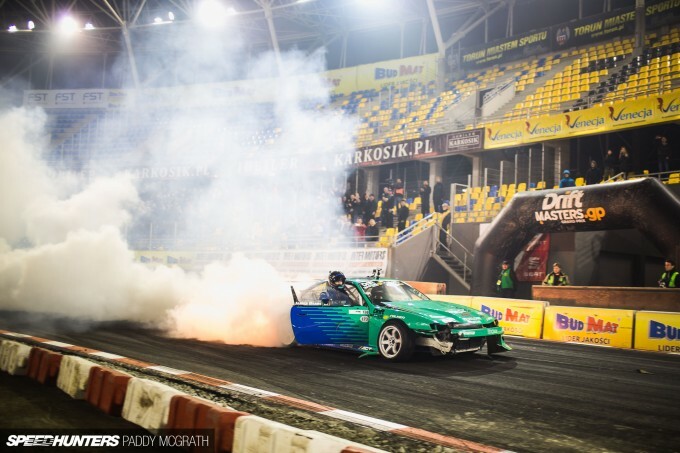 Event was organised by Drift Masters Grand Prix - polish drift legaue. 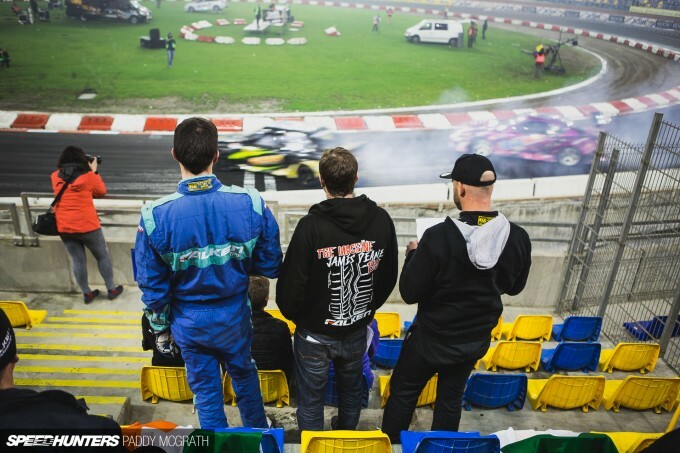 Drift Allstars was only co-host of that event. A well earned championship title!! I think it would be cool to see James in FD again, but I definitely don't think its worth his time or personal money. If a major team or factory backed effort smartens up and approaches James with a lucrative contract, and provides him full support, then I would say go for it. 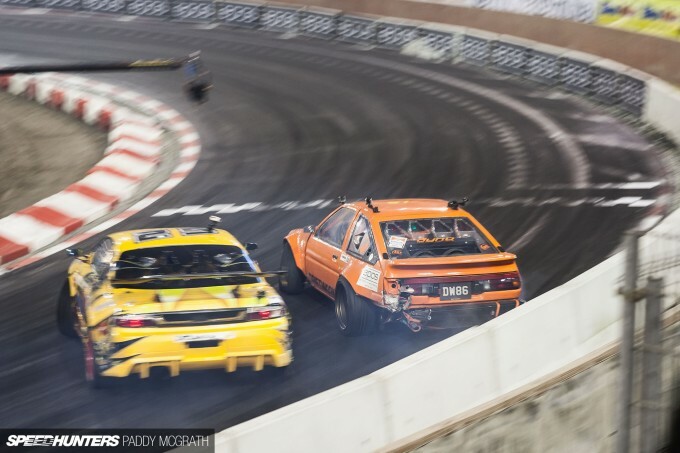 Otherwise, who cares about FD. 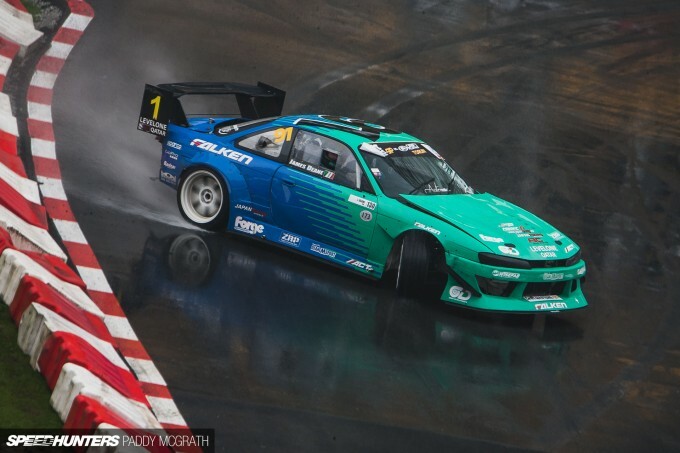 What has America done that it deserves all the best drifters to come here on their own dime, when a majority of the American drifters won't even go to Canada to compete, never mind Europe or Japan lol. 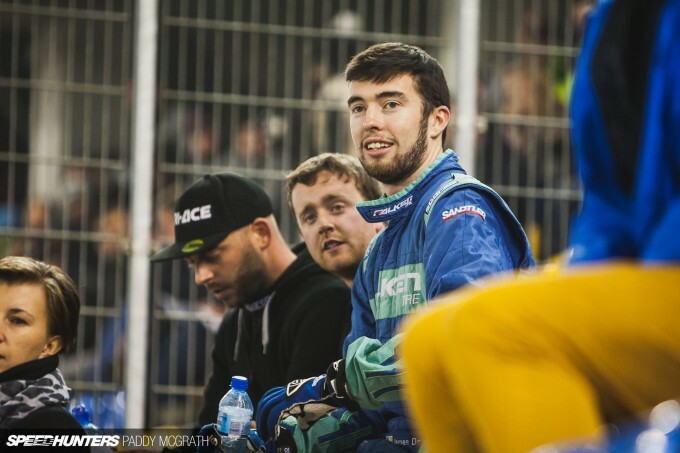 James can keep competing in Ireland, Britain, and the rest of Europe, continue to be an instructor in the Middle East, and maybe make the odd appearance at some international events, and he'll be miles ahead of 3/4 of the FD field in terms of exposure. 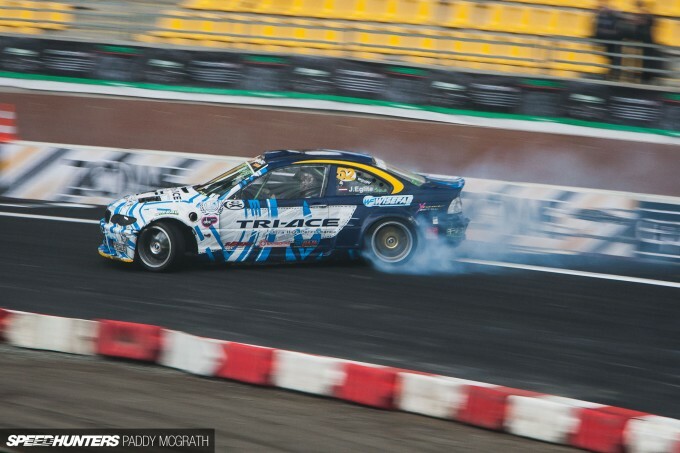 More than FD, I would love to see James head to the Southern Hemisphere for a winter and do some Aussie and D1NZ comps, maybe make some events in Japan if possible. 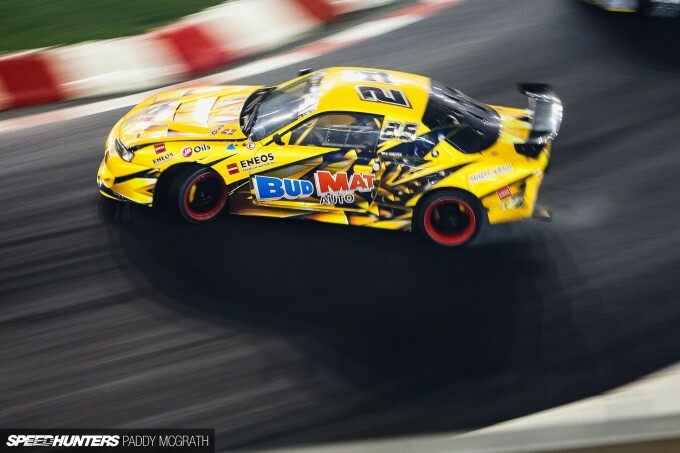 @Mk2Mad If I'm being honest, it would be between James and Fredric Aasbo as probably two of the most naturally gifted drivers I've ever had the pleasure of watching. Would love to see the two compete some day. Twitch_6 It's a good point and something I've noticed a lot more recently. 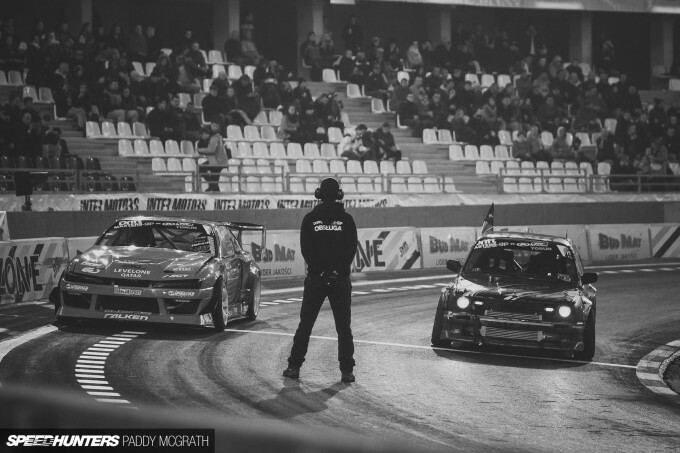 Where in years previous, guys would be on the first plane to FD after achieving some success in Europe, now they're hanging around and continuing to fight it out. 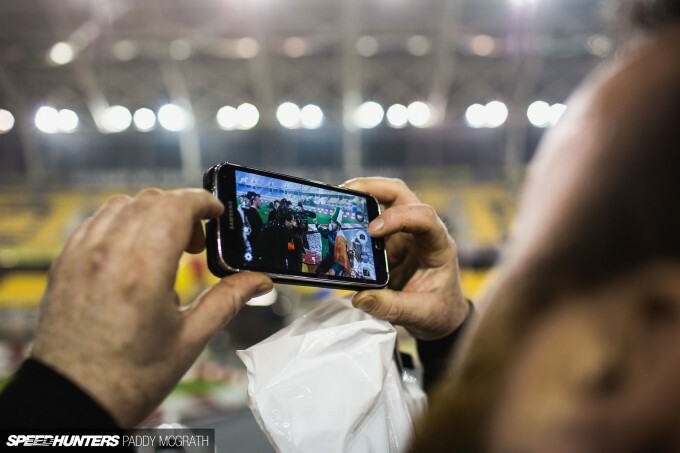 Cost is obviously a big issue, but it's not exactly cheap to compete across Europe either. MaciejMaroszek Correct! 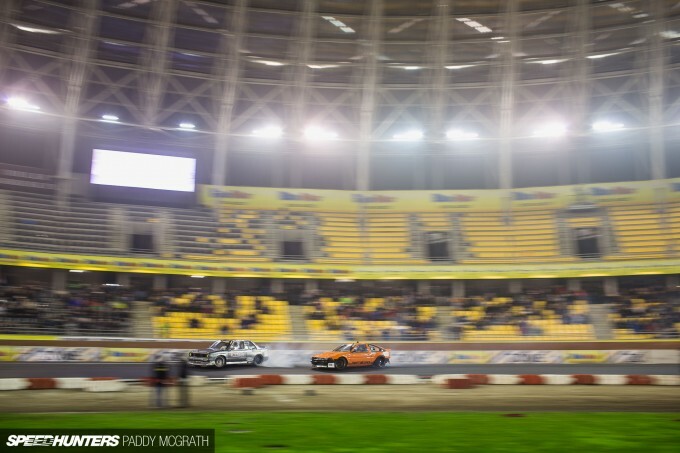 Saturday was a Drift Allstars points scoring round, with Sunday being reserved for DMGP. 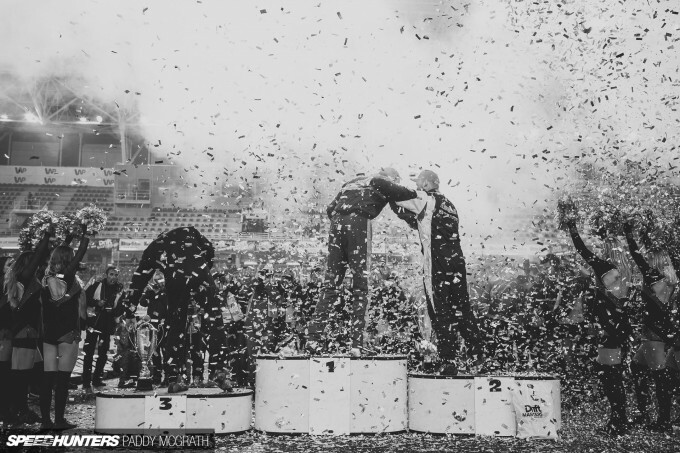 Congratulations to Piotr Więcek on winning the Polish title! "if a driver lost any car parts from running the wall – be it a bumper, light or wing – they would be scored a big fat zero" good! I hate seeing so much work go to waste. 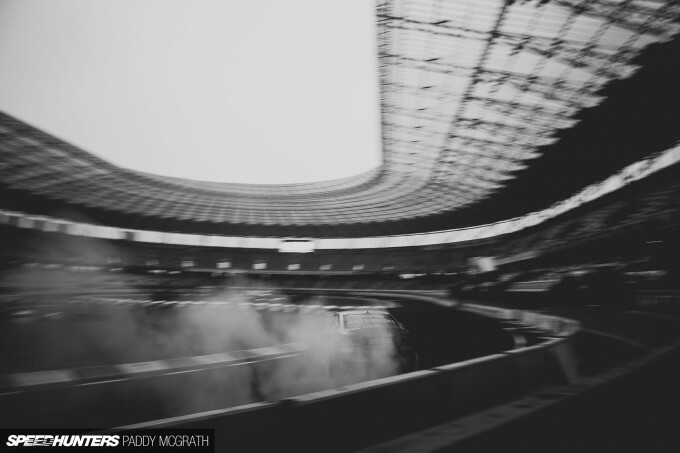 @Paddy McGrath, that's well said, better than my post. I'm one of those people who is probably overly critical of FD at the moment, but that aside, your point of the level of these other series increasing is mostly why I feel FD is not the be all end all. 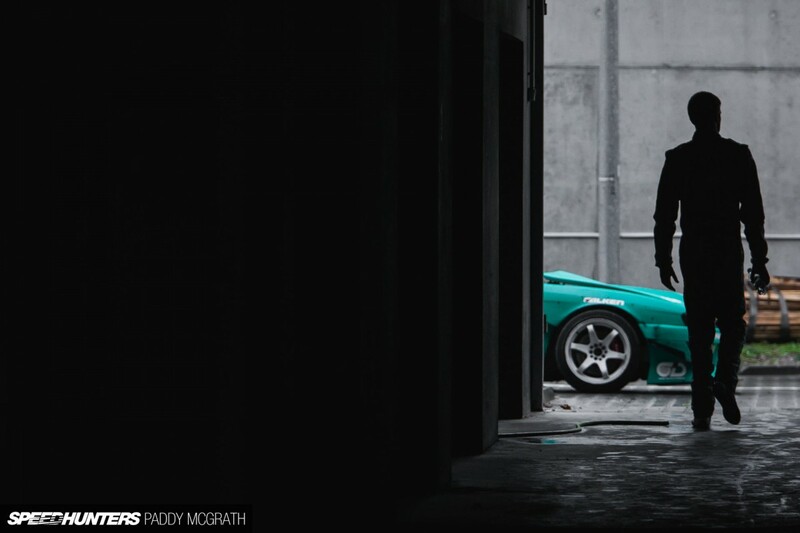 FD is still the king when it comes to insane car builds, but the other series are catching up. 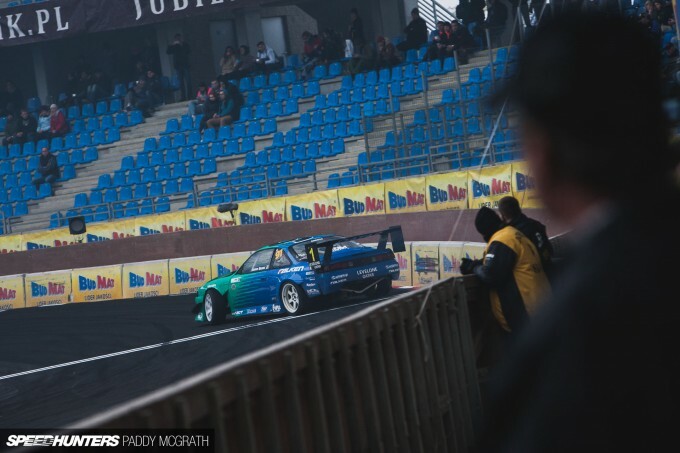 And while FD cars might still be the most advanced and have the biggest budgets, the actual level of competion in Europe and Aus/NZ (and Japan of course) is very high, and in my opinion, on par with FD at the very least. 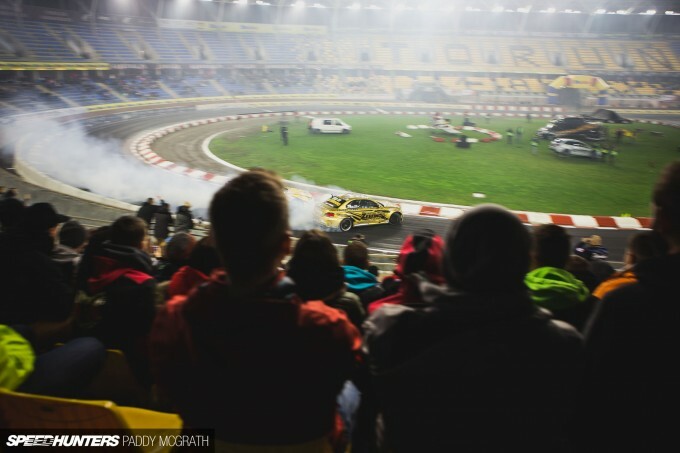 Not to mention, I would say the actual tracks/sections in Europe are better than what FD uses. 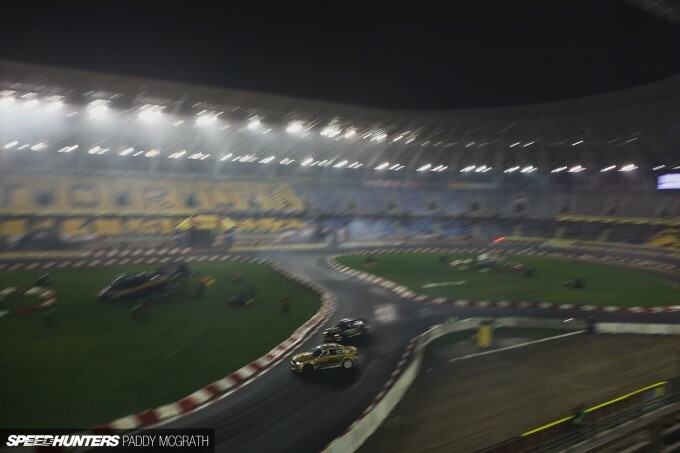 Other than LBC and ATL, would you really be that interested in spending all that money to go drift in a bunch of fishbowls, when you live on the content with the most race tracks per square mile in the world? This is pure speculation though, and more my own personal approach to the situation....I've no idea how James feels about the whole thing lol. Twitch_6 Agreed, point well made. 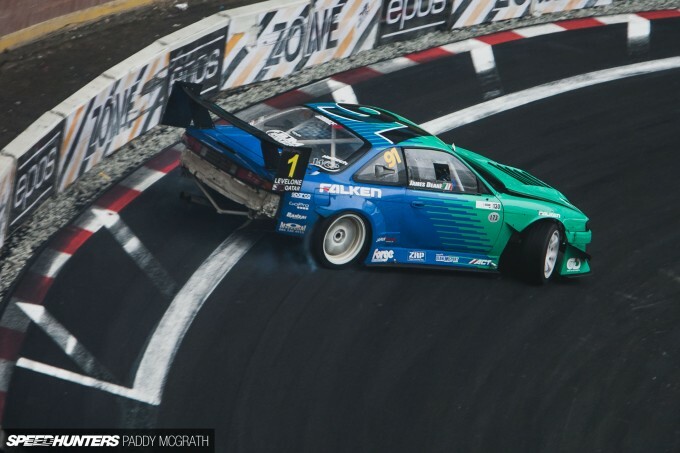 I'm no massive lover of FD either but its the only series I see where certain drivers have full back up - something I think Deane deserves. Europe is progressing and if gets to that kind of stage in the next few years all the better. 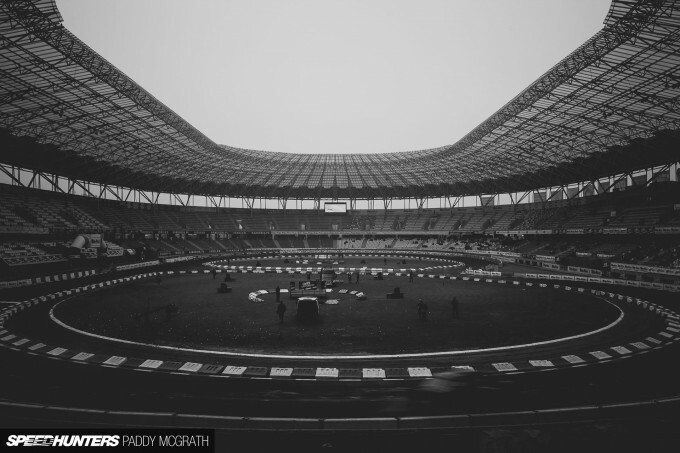 Is a bigger question really if the sport will get to that level as a whole, we'll see I suppose. It's just frustrating to see someone at the top of the sport that committed, talented and driven still running their own show. Love of the game eh. 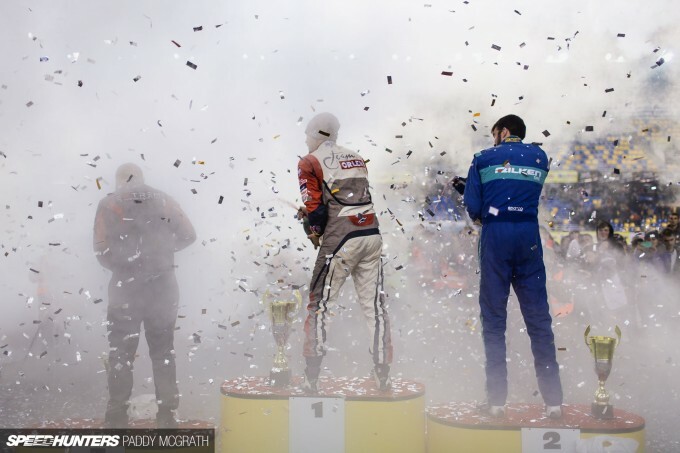 JakWhite I agree with you in principle, but it was harsh on some drivers who maybe lost a part, but never changed their line or affected their run and ended up with a zero. 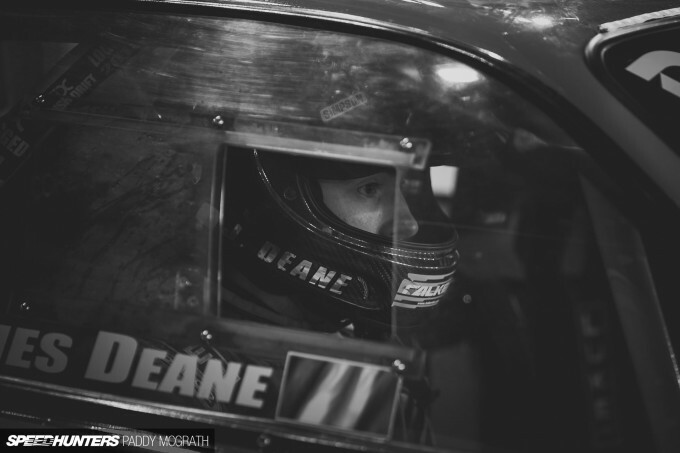 It might sound odd, but I always root for whoever is up against deane when competing against the other irish drivers. I always view his challengers as the underdogs, And everyone loves an underdog. I think that's the best way I can describe how good I think James is. To beat him is truly an accomplishment worth boasting. However, I can see alot of drivers biting at his heels in 2016. Keily and shannahan especially. I have been saying exactly this for 4 years, they are the two best drivers of all time. 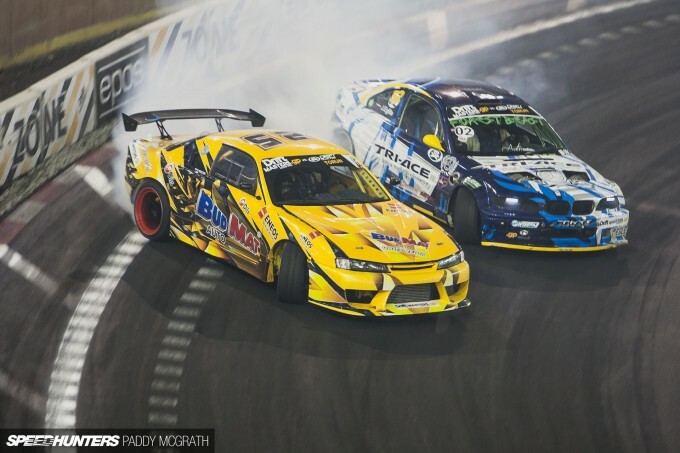 I know the day will eventually come that they will meet in a battle, it will be the climax of all competitive drifting that has gone before it. I also feel that in about a decade, kiely will surpass those 2 to be the greatest. 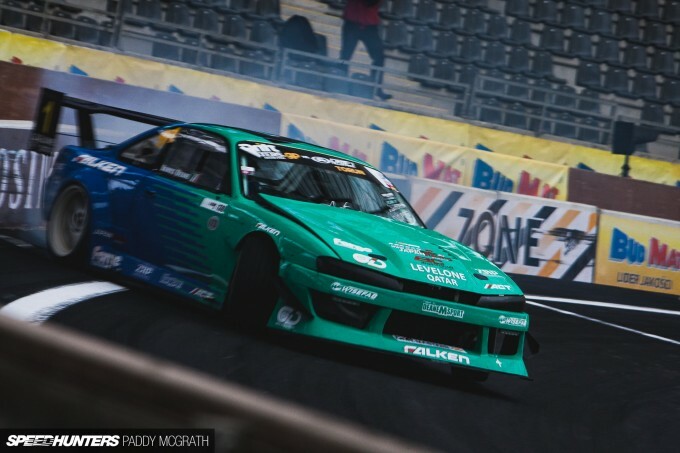 Paddy McGrath Peter_Kelly How do you think Deane/Shanahan/Kiely would do against guys like Nakamura/Hiro/Yokoi in a similar car on a track such as Meihan or Nikko? Tough one. There's a pretty big range in terms of budget and power if you compare their comp cars, so I think those are out of the question. Then there's missiles, or street cars, with less power...but are those kids as good with low power as they are with 500+? I don't know. The Japanese guys you mentioned certainly are. 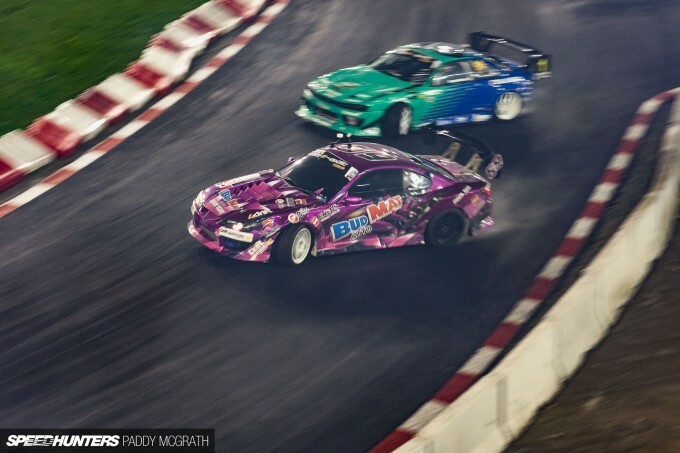 All that said though, if those 3 got to spend a little time in Japan, got some seat time in say a D1SL car, and had a little time to familiarize themselves with the tracks (face it, no one with 0 laps around Ebisu or Meihan is going to beat Nakamura on their first go), I think they could hang with the best Japan has to offer. 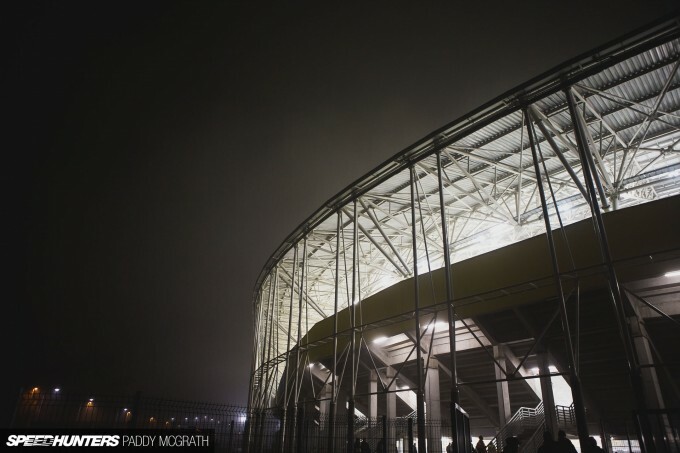 Superb photos. Loving the gratuitous bonus pics. Didn't see a whole lot of the event (can't agree with you more about James' epic final chase run) but the losing bodywork is a bit silly, it could in theory come down to who has stronger cable ties. elvexilix Thanks, it was a tough event to shoot. Maxamum atttack I'm trying to get something, but there's a delay with any videos being shared immediately after the event due to rights restrictions with the live TV broadcast. Bubbag6 Exactly. Also, if you have a single piece rear clip, that gives you an advantage too. It was a strange one, especially as they were encouraging a strong outside line. POLISH power Well, he's two times consecutive European champion, so he IS the best driver in Europe at the moment. 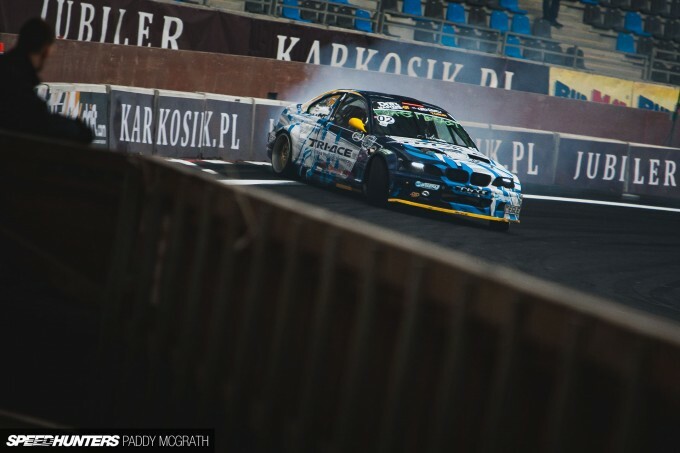 Więcek is an awesome, awesome driver. There's rumours he might visit Ireland next year to have a crack at Ireland's unbeaten streak and I think there's the potential for an almighty event if it happens. 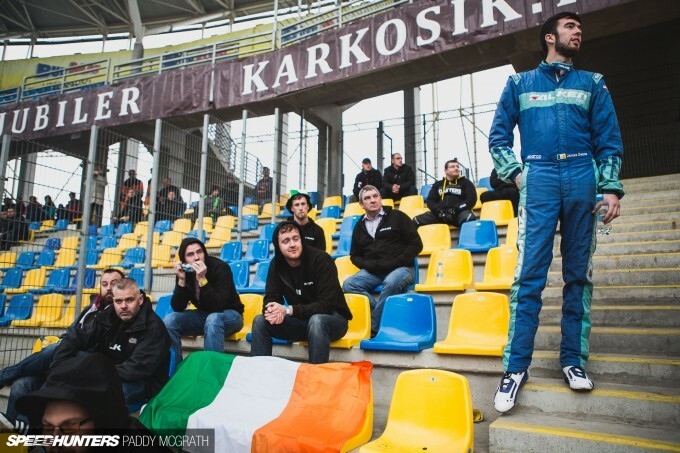 Would love to see him in Mondello, along with Karkosik and his new 370Z. What's happening with Trela and Polody these days? As far as the rest is concerned, we'll have to agree to disagree. The scoring zones on the wall looked very shallow too or is it just me. Yeah, they were increased in depth for the battles by around 30cm with the criteria changing too. Yeah, it would be anyone's guess as to how they would get on when dealing in hypotheticals. As Twitch_6 said, given a fair amount of practice, I'm sure they would have no bother hanging out with the Japanese drivers. Yes, Kiely beat Daigo this year. Please stop yelling that we are the best. 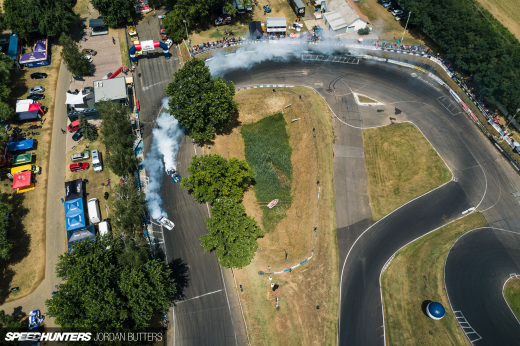 Yes, we have some awesome drift layouts but are they really the best? I don't think so. They are very good but imo not the best. 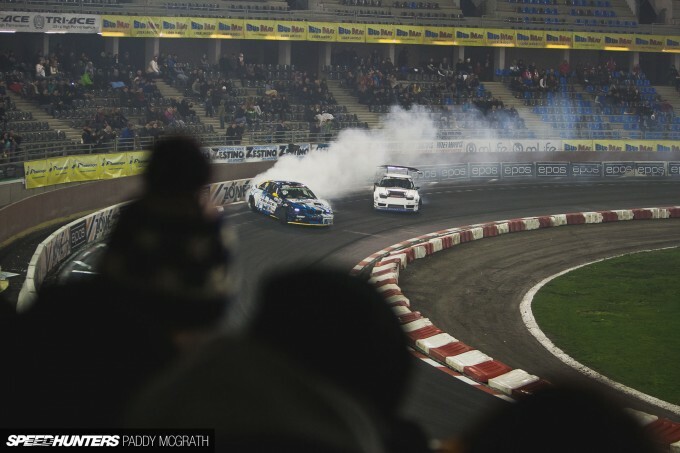 We are lucky that we have Drift Masters Grand Prix series which organize one of the best events in Europe. The truth is that we are unlucky because no one know what we can do. 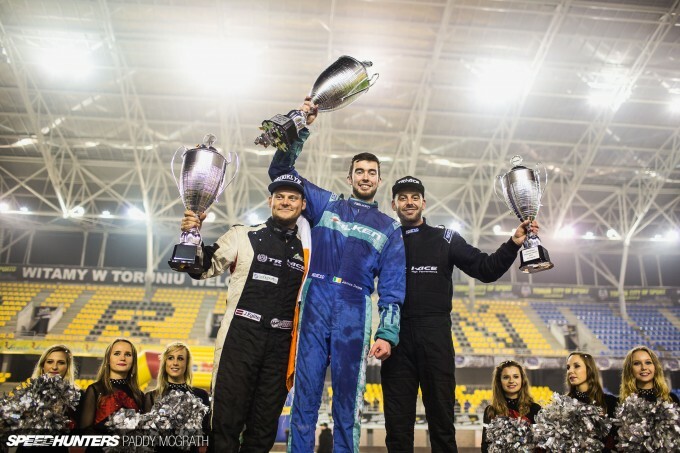 90% of our drivers compete only in polish leagues… they should go abroad to "bigger" leagues and at the end of the season tell the world: HEY! 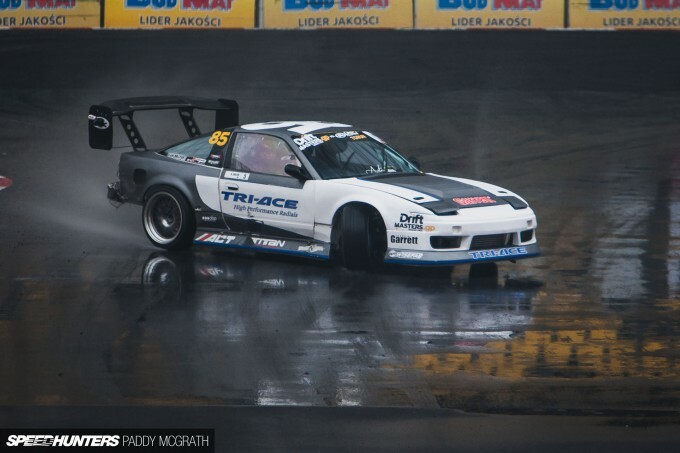 I'M FROM POLAND, WE ARE REALLY GOOD DRIFTERS! LOOK AT ME! 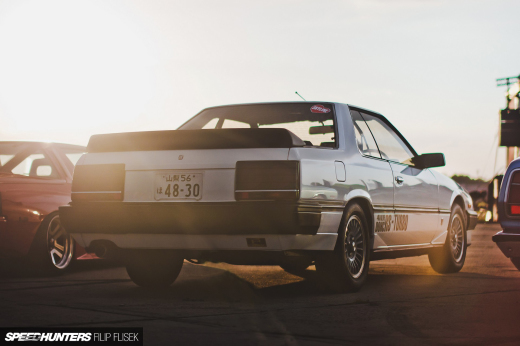 Young drifters? Zalewski is good but i really appreciate Jack Shanahan. 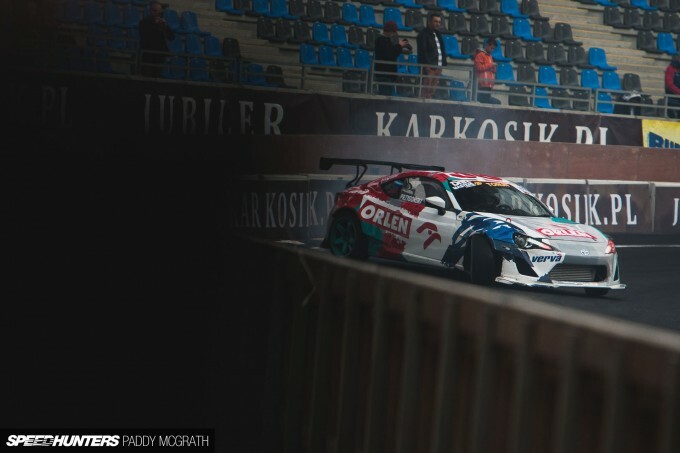 Karkosik have 370Z but is he competing in this car on any event? 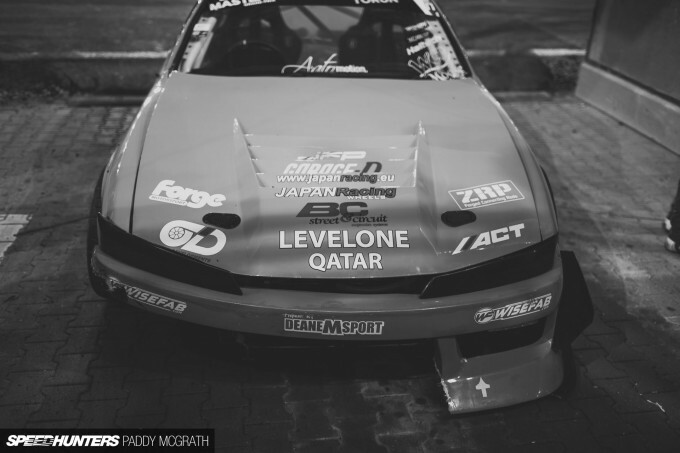 Trela was great when he drove S13,5, and I hope that he back to the top ASAP. Sorry for my english skills. POLISH power How silly and naive to keep yelling " the polish is the best". Europe is big, the world is even bigger. 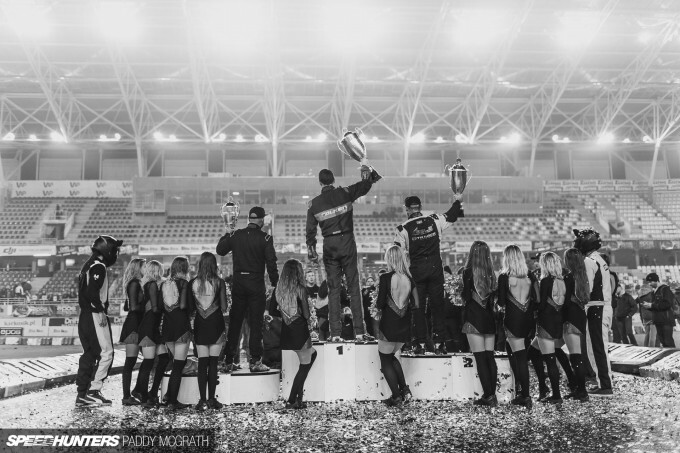 A small national series ( DMGP as you said) doesn't mean too much compare to other international series which a lot of international driver involved. 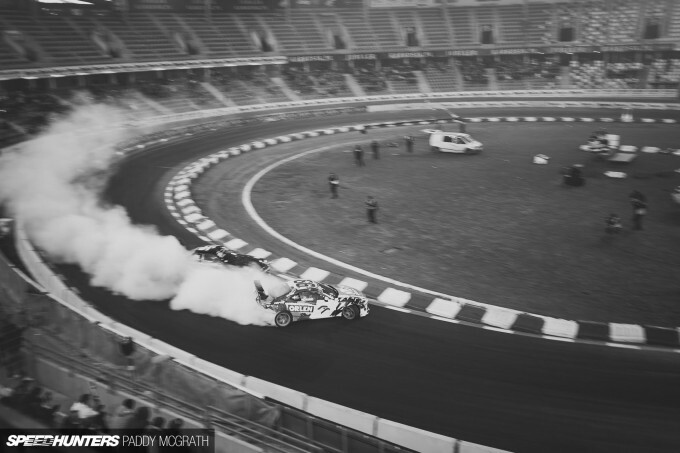 Broaden your horizon to the big big international drift world instead of being frog lived in a shallow well. Thank you for this, Paddy. 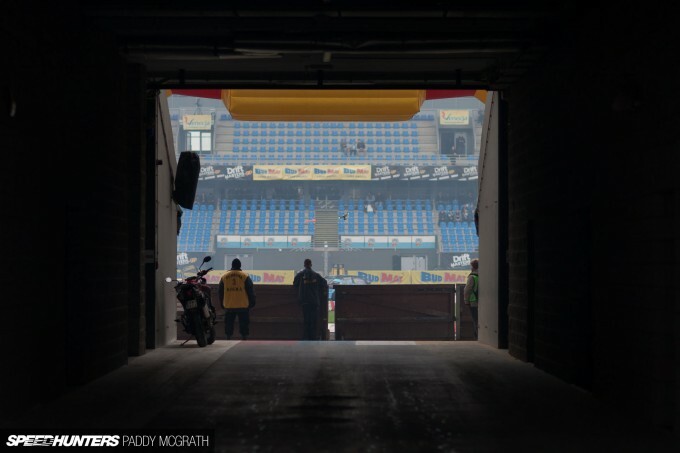 Absolutely fantastic photos, and an incredibly well written article. 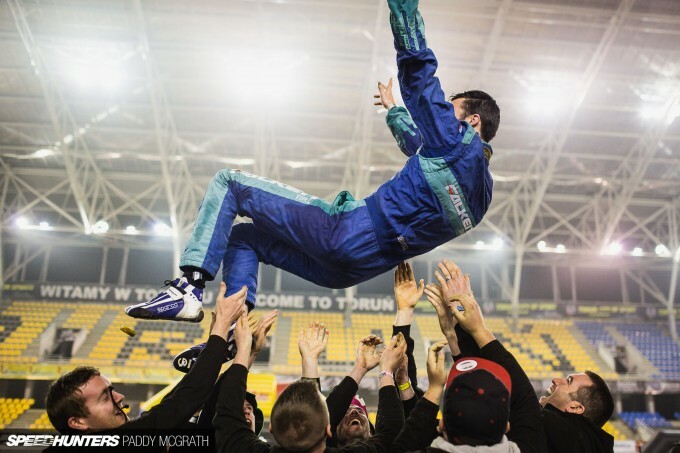 Congrats to James on winning the championship, which was as well deserved a win as Aasbo in FD. 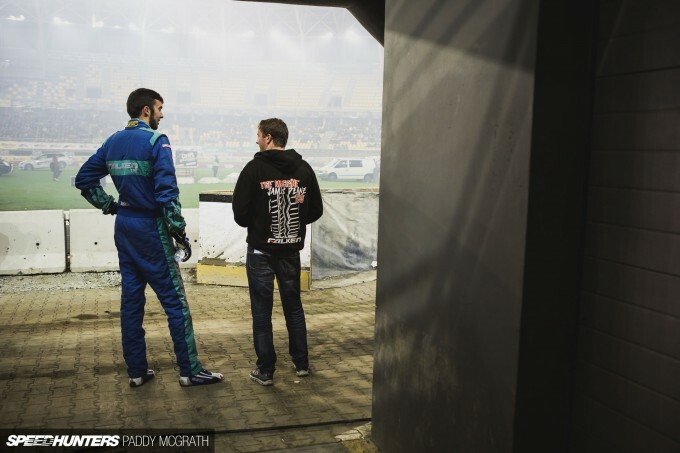 I would love to see them battle in the future as I don't think they have done so in years and they have both progressed immensely as drivers since then.